My sad story is that I constantly fall in love – with plants that I can’t grow. But if your garden (unlike mine) is sunny, hooray! Here’s a great one for you. The delightful name azure blue sage (Salvia azurea) refers to its sky-blue flowers in late summer and early fall. Right about now, for instance. It gets big bonus points for being a drought-tolerant, pollinator-friendly, native North American prairie plant. 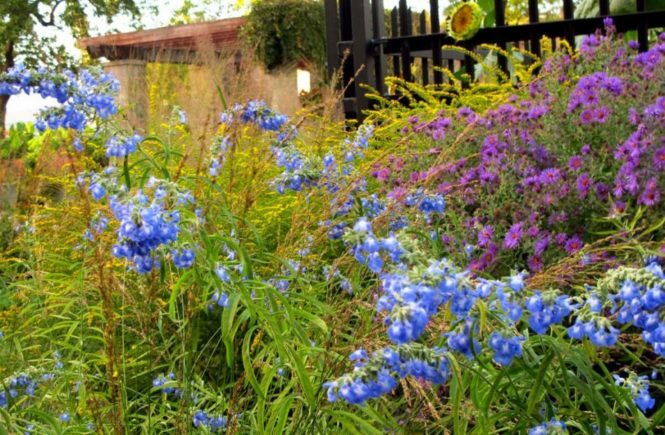 In fact, all three flowers in the picture above are natives, including the spiky goldenrod (Solidago rugosa) on the left and New England asters (Symphyotrichum novae-angliae) on the right. 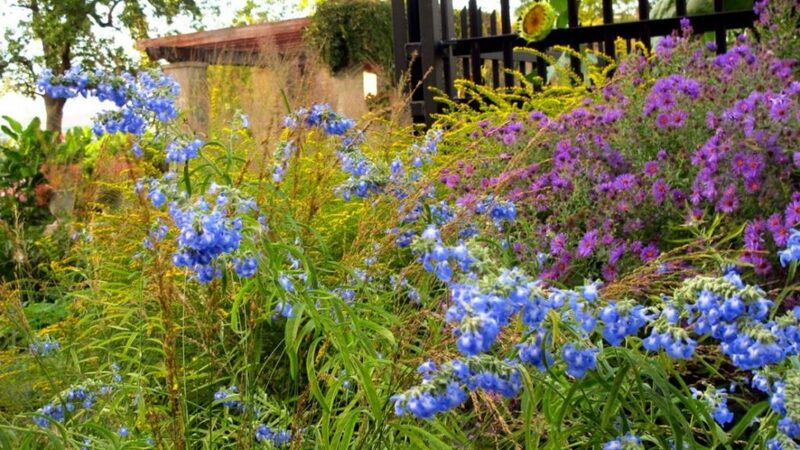 Yes, a native plant garden can be a pow of colour. Well, certainly a full sun native garden. Azure blue sage (Salvia azurea) at the Montreal Botanical Garden (MBG) in late-September, looking like sapphires against an amethyst background of asters. Because of the large size of the individual flowers or florets above, I’m wondering if this is the variety Grandiflora. The worst that my research has turned up about this plant is that it can get floppy, especially on fertile soil. But cutting the new growth back once early in the year can help keep it more compact. These were about 3.5 meters or 5 feet tall at the MBG. 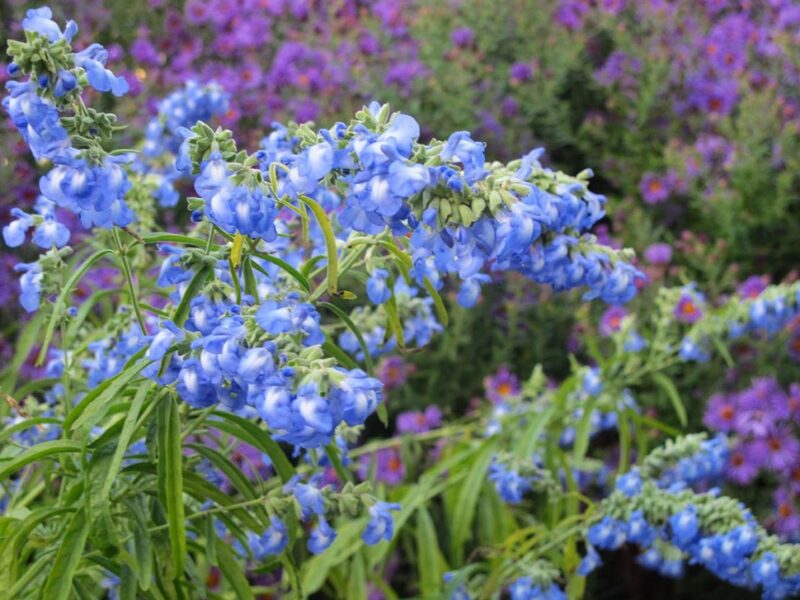 However, plant breeder and author Joseph Tychonievich has bred a shorter cultivar called ‘Blue September’ which you can get through a grower if you live in the U.S. Keep your eyes open for it – perhaps it will reach Canada one day. I’ve looked around for a Canadian source for azure blue sage, with no luck yet. Please chip in a comment if you know one. Thanks for the link. This is a UK seed company, and from their shipping info they ship worldwide. I checked the Canadian customs regulations, which say small amounts of seed (less than 500g.) might make it into Canada (no guarantees; customs officials can be whimsical about this) but this supplier adds a pretty hefty shipping cost to the delivery. The US supplier of Joseph’s cultivar doesn’t ship across the border, I know. I’m hoping we can find a Canadian supplier. Anyone? That color is just outstanding. Thanks for highlighting this plant. I do wonder if it would make it through my winters, which are not just cold, but wet.Would be willing to try! Wet winters and sage might not be the best combination, unless the soil is well drained. Do you have any sunny part of the garden with sharp drainage? My sandy soil is exceptionally well drained, but sunshine is the ingredient for success that I lack. Maybe we could trade – a bit of mine for a bit of yours? Hi Helen – I just realized that your feed was not updating on my reader ever since the switch to your new format. Just relinked the feed and all is now well! As it happens, I’m looking around for blue plants to add to my grow list and this seems a winner. A shorter cultivar would be nice, however, as I know myself well enough that cutting anything back during the season is a hit or miss proposition. Thanks for the info about your reader, Margaret — there is a redirect if you click a link, but I guess that doesn’t happen with the blogrolls. One flaw with WordPress, too, is the lack of an updating blogroll. I have to do a workaround with a menu, with only a link to the website. Anyway, yes, look out for this one. If you find a Canadian source, please let us know! Sharon Fisher on Want to win the Gardener’s Gratitude Journal?